Supposing you wanted all the headaches and potential fuel consumption of a Lotus Eclat trio, but only had space for one car. Then, only a cheap luxury car produced in small numbers (AKA future classic, we’ve seen it happen with many other cars) will do the job. Remember, now’s your chance to get in and be the guy who bought a 6.9 for $3600 – who cares if you spend four times that repairing expired vacuum-actuated accessories, fancy suspension bits, and more. 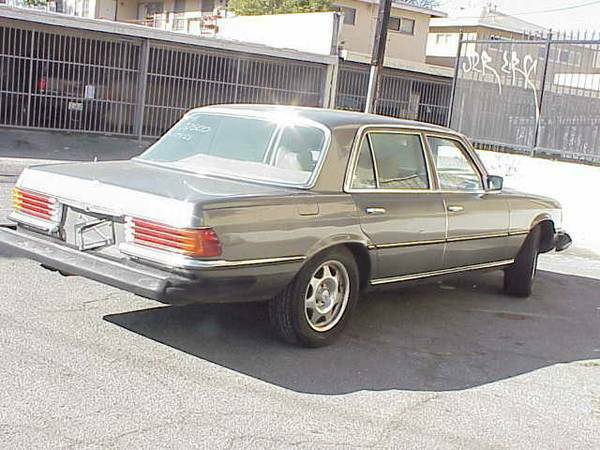 Check out this 1978 Mercedes 450SEL 6.9 for sale for $3595 in the San Fernando Valley, CA. In spite of the admittedly poor quality of these cell phone pictures, this car looks pretty good. Paint is not coming off in sheets, and it has been tastefully upgraded with a newish set of wheels from a first-generation CLK coupe. These subdued grayish/greenish colors work well on large luxury sedans, and are easier to maintain than black or white. While the seller has a clean title in his name, the car is said to be unregistered – whether that means non-op status or just expired registration is not clear. Does anybody know why the 6.9 received different extra-large North American bumpers versus all the other W116s? While the others were not exactly elegant, these took things to another level of ugly, matching or bettering the solutions from Alfa Romeo and MG in terms of spoiling the car’s aesthetics. Maybe you can spend some of your repair budget on a European bumper and headlight conversion. Remarkably, the car is said to only have 123,000 miles, though you’ll want to rely on any repair records and your own assessment (or a pre-purchase inspection) to better understand its condition. As you might expect, the engine bay is not spotless, but it’s not full of spider webs or filth either. 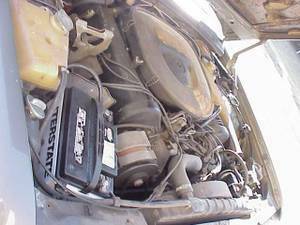 The underhood insulation seems to be missing, and while things look packed down there, key items like the alternator and distributor are easily accessible in the front of the engine compartment. While the North American version of the car was choked by emissions laws, it put out a still-respectable 250hp and 360 lb.-ft. of torque, enough to still give many modern cars a run for their money. 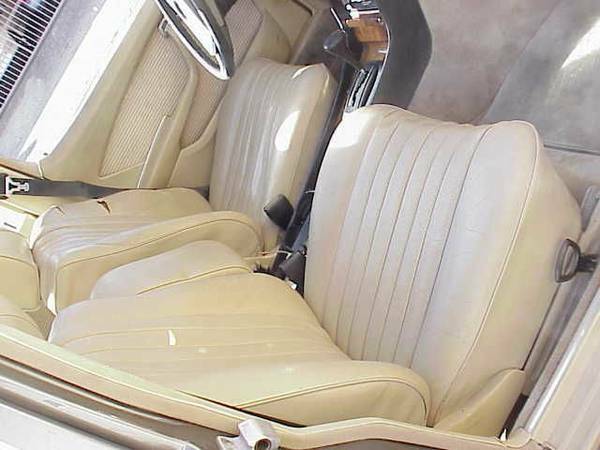 While the interior is showing some wear in the form of splits in the driver seat and failure of some of the padding, it still looks pretty clean. 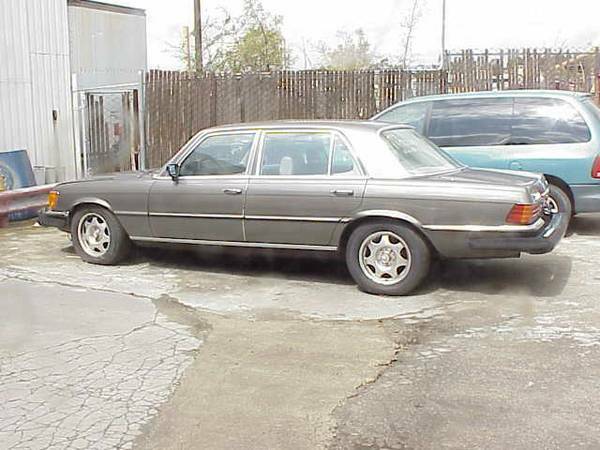 The 6.9-only burl wood dash still seems to be intact, but other than that, the engine, the badge, and the self-leveling suspension, there’s not much difference between this and a regular W116 Mercedes. So if you’ve always wanted to re-enact C’était un rendez-vous, Ronin, or Lost Highway, here’s your chance to do it on the cheap! This entry was posted on August 25, 2014 at 4:29 pm and is filed under Bad Ideas, Feature. You can follow any responses to this entry through the RSS 2.0 feed. You can leave a response, or trackback from your own site.